This is a very simple and brilliant visualization of all planets known to humankind as of June 2012. There are 786, including the eight in our Solar System, which is shown in the gray square in the center. First, it's really amazing that we have detected so many already. The number is growing really fast now, but soon the figure will really start exploding. What's better: we are now getting good at detecting tiny planets like our Pale Blue Dot. But what is really mindblowing is that these are just an infinitesimal fraction of all the planets that are out there. Think about it: our galaxy alone contains a minimum of 100 billion planets. Of those, most are small planets like ours: 10 billion terrestrial planets. Ten. Billion. The fact is that, statistically, every star would have at least one planet, according to the most recent studies. And there are about 500 billion galaxies in the universe. It really boggles the mind. 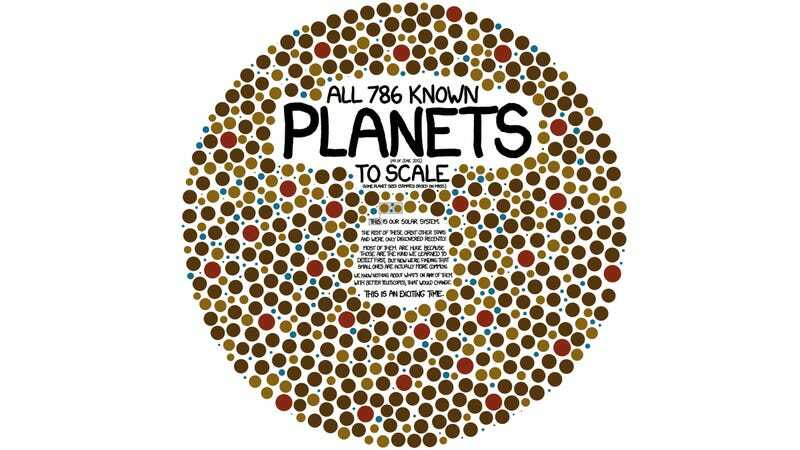 Now imagine the piece of paper needed to put all these planets at this scale. It would probably take over the entire solar system. Clearly, the possibility of alien life is now almost impossible to deny. Another different matter is if it we are condemned never to contact whoever is out there. Hopefully, humanity will reach the stars one day and we will say "hello" to someone completely different than ourselves.